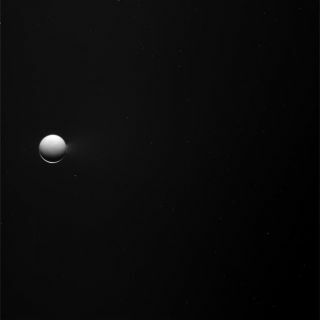 NASA's Casini spacecraft obtained this raw image of Enceladus on April 26, 2010. The camera was pointing toward Enceladus at approximately 946,585 kilometers away, and the image was taken using the CL1 and IR3 filters. This image has not been validated or calibrated. A validated/calibrated image will be archived with the NASA Planetary Data System in 2011. Scientists are eagerly poring over new observations ofSaturn's moon Enceladus ?beamed to Earth from NASA's Cassini spacecraft from aflyby last week that measured the moon's gravitational tug in an experiment todetermine its interior structure and composition. The flyby, which occurred April 27 at 8:10:17 p.m. EDT (0010:17GMT on April 28), took Cassinithrough the water-rich plume that flares out from Enceladus' south polarregion. At closest approach, Cassini was about 100 kilometers (60 miles) abovethe surface of Enceladus, at a speed of 15,000 mph relative to the moon. In a new Enceladus photo released by NASA, the moon lookslike a crisp orb in space with one end ? the south pole known to be home to icygeysers ? appearing hazy through the plumes there. Cassini'slow flyby would have been ideal for snapping new photos of Enceladus, but theprimary objective of the mission was to collect information for the gravityexperiment. Thenew photo, for example, is a raw, unprocessed image. "Radioscience was prime through this flyby, meaning that it got to control spacecraftpointing, which precluded pointing the optical instruments at Enceladus,"said Robert Mitchell, Cassini program manager. "So, unfortunately, theimaging camera did not take up-close pictures." Instead, theimaging camera was only able to obtain more distant pictures. As part of Cassini's 26-hour gravity observation, a steadyradio link to NASA's Deep Space Network on Earth enabled Cassini scientists touse the radio instrument to measure the variations in the gravitational pull ofEnceladus. Detecting any changes will help scientists understand whatlies beneath Enceladus' famous "tiger stripe" fractures, which spewwater vapor and organic particles from the moon's southpolar region. The experiment was also expected to help scientists learn if the south polarregion's sub-surface resembles a lava lamp. Scientists have hypothesized that abubble of warmer ice periodically travels up to the crust and repaves it,explaining the quirky heat behavior and intriguing surface features of thisregion. TheCassini probe launched in 1997 and arrived at Saturn in 2004, where it droppedthe European Huygens probe on the cloudy surface of the planet's largest moonTitan. Cassini was slated to be decommissioned in September of this year, buthas received an extended mission that now runsthrough 2017. TheCassini-Huygens mission is a joint project of NASA, the European Space Agencyand the Italian Space Agency. It is managed by NASA's Jet Propulsion Laboratoryin Pasadena, Calif.